The business model of commercial (free-to-air) television relies on advertisers to pay for programming. Viewers ‘inadvertently’ watch advertisements that are bundled with programming. Advertisers have no reason to pay to have their ads embedded if the viewers succeed in unbundling the advertisements from the entertainment content (advertising bypass). 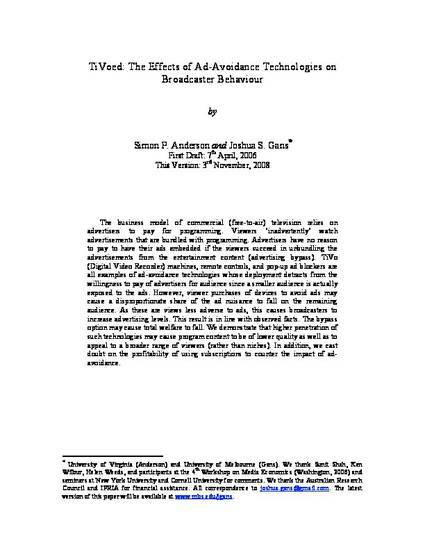 TiVo (Digital Video Recorder) machines, remote controls, and pop-up ad blockers are all examples of ad-avoidance technologies whose deployment detracts from the willingness to pay of advertisers for audience since a smaller audience is actually exposed to the ads. However, viewer purchases of devices to avoid ads may cause a disproportionate share of the ad nuisance to fall on the remaining audience. As these are views less adverse to ads, this causes broadcasters to increase advertising levels. This result is in line with observed facts. The bypass option may cause total welfare to fall. We demonstrate that higher penetration of such technologies may cause program content to be of lower quality as well as to appeal to a broader range of viewers (rather than niches). In addition, we cast doubt on the profitability of using subscriptions to counter the impact of ad-avoidance.